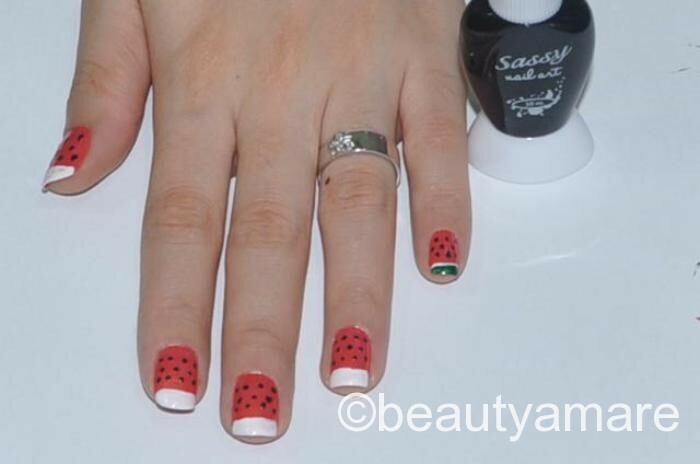 beautyamare: Lovely Watermelon Inspired Nail Art! 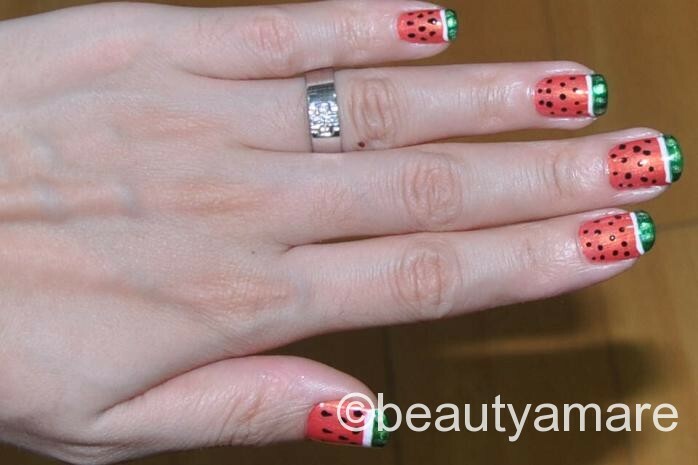 Lovely Watermelon Inspired Nail Art! I love to see other people's nail arts especially my friend's and this design is one of them! A shout-out to my friend "JAM", whose nails are pretty and cute. I saw this design on her Facebook so I asked her if I can re-create the design, and she said, "YES"! 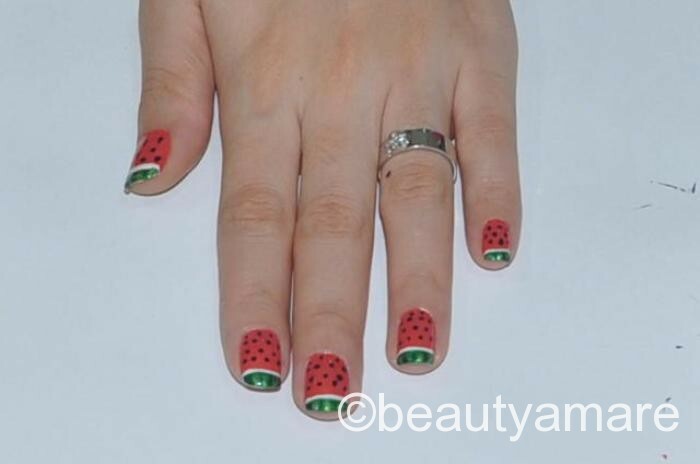 Here's the the Lovely Watermelon Inspired Nail Art! STEP 1. Prepare the lacquers needed; red, green, white and black. Prep your nails by using base coat and then paint your nails 2 coats of the red lacquer. Let it dry. STEP 2. Get your white lacquer and create a thick french tip. Once dried, get your green lacquer and create a thinner french tip. Make sure to show a little of the white lacquer. STEP 3. Get your dotting tool and black lacquer. Dot your nails neatly in rows, then let it dry. And lastly, apply your top coat to seal in your design. DONE WITH 3 EASY STEPS! 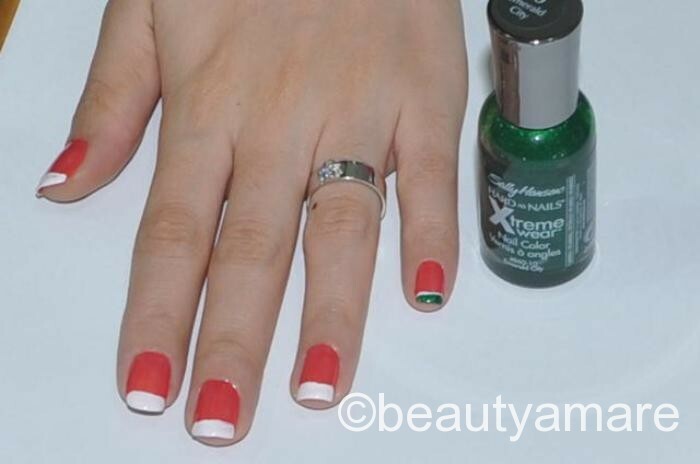 Don’t forget to join beautyamare.com for more Fashion, Beauty and Nail Art ideas.